You know the stress of being a parent. When the kids were young, you jumped at every sneeze, cough and wobbly step. Now that they're young adults or teenagers, there are different stresses. Are they driving while distracted by texts and social media messages? At home, are they safe? Are they being responsible for getting home on time from school, not raiding your liquor cabinet and staying indoors until you get home? Teenagers and young adults put themselves in a lot of risky situations. You might remember doing that yourself years ago. But, thanks to our sponsor SimpliSafe, you can greatly reduce those risks while alleviating your stress level. SimpliSafe is a lot more than an affordable, state-of-the-art home security system. It's a system that lets you remotely monitor your home and your grown children. You can monitor your home when you're at work or running errands. You've most likely heard about SimpliSafe. It's the wireless security system that Kim Komando uses in her home. SimpliSafe isn't like the old-fashioned home security systems you used to use. Those systems require a technician to spend hours in your home, drilling holes in your walls and installing complex wiring. You can install SimpliSafe yourself in about an hour. Plus, unlike those old-fashioned systems, SimpliSafe does not lock you into a contract. You can use it when you need it. You can also take it with you when you move - try doing that with a wired system. SimpliSafe provides multiple layers of protection. For instance, you can install motion detectors, Freeze Sensors to alert you when your water pipes are in danger of freezing. You can install the 24/7, high-definition camera, SimpliCam, so you can watch what's going on at home from wherever you are. Thanks to SimpliSafe you can protect your family from many different dangers. Incredibly, it costs less than $15 a month. Click here to get free shipping on your SimpliSafe system because you're a Komando.com reader! Do you know that you can remotely monitor your home with SimpliSafe? Say you're at work and you have grown kids coming home at different times of the day. You'll know when Bobby is home and you'll know when Annie is home, even if they're on different schedules. 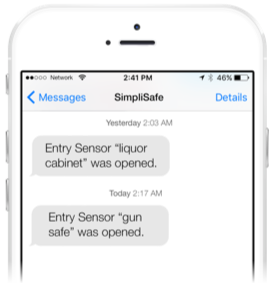 With SimpliSafe, you can order remote control keychains for each of them. Plus, your family can have up to five Personal Identification Numbers (PINs). That way, when each family member comes home, they can key their individual PIN into the SimpliSafe wireless keypad. You'll know that Bobby came home on time and that Annie didn't. Of course, teenagers might forget how to disarm the SimpliSafe home security system. Don't worry about it. You can remotely arm and disarm the system from your laptop, tablet or smartphone. Speed means everything when your family is in danger. Your life can be upended forever in a split second. That's why SimpliSafe is such an important system for your home, whether you live in a two-bedroom apartment or a 10,000-square-foot home. Your system is monitored by SimpliSafe 24 hours a day. More importantly, the police and you will be quickly alerted. You'll receive a text message or email as soon as SimpliSafe detects a problem. The police will be alerted when your SimpliSafe system is activated. That includes SimpliSafe alerting the police if an intruder smashes your SimpliSafe keypad. If you have teenage children or young adults in your house, you know the dangers in your home don't always come from outside. Sometimes, your teenagers get into trouble on their own. These risky events don't necessarily require the police. But they do require your knowing what's going on. Do you have a firearm locked up in your home? Would you know if your teenager or one of their friends unlocked it? Do you keep expensive jewelry in a safe? Do you worry that your teenagers are sneaking out of their bedroom window? With SimpliSafe's Secret Alerts, you can have sensors that are triggered when someone tries to do something they shouldn't be doing. You'll get a message alerting you when that happens. You can protect your teenagers and adult children for less than $15 a month. Click here to get free shipping on your SimpliSafe system because you're a Komando.com reader! You know that a home security system is critically important to protect your family, your home and your valuables. However, there's a very good chance you don't know where to place home security cameras. A new research study reveals the surprising answers. Click here to find out where you must place your home security cameras.